Once this screw is loosened (on both pieces of the fence) you can open it to about 4 inches. On the fence there is a rather elaborate hold down and feather board system that I feel are just in the way. The clear acrylic piece on the bar in the picture is the feather board. A big issue I have is with the power switch, it is located on the end of the table behind the rail for the sliding table. 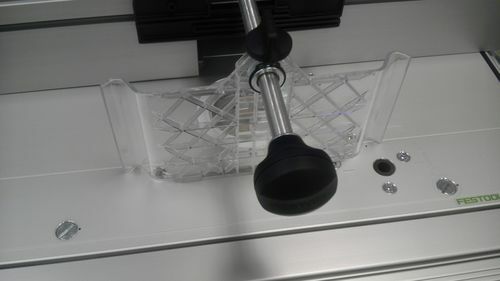 I’m sure they put it there for the table saw set up (in Europe the same table is used with a different insert to turn the TS55 into a table saw) but on this set up it is difficult to get to if you’re in a panic. And it is not movable. Finally I have a problem with the size of the table, it is rather small, in my opinion. I’m use to using a router table that is a bit bigger, especially if I’m doing panel routing. To change bits you either have to lower the router all the way down on the lift (which does work very well) or remove the plate and turn it over to reach the collet nut. Unless you have some metric bent wrenches, the collet is not accessible from the top of the table. As for performance, well if you’re familiar with Festool routers, then you have a pretty good idea how they preform. In conclusion, I feel the table is way over prices and poorly designed. You have to use a Festool router with it (which if you have either the OF1010 or OF1400 they are pretty easy to take in and out). Since the OF1400 is the largest that can be used in the table (in the USA) then it is under powered and would be difficult to use large bits like raised panel bits. If I had $1600 to drop on a router table set up, I’d purchase the Jess-Em Mast-R-Lift Excel II table for $999 and get the Porter Cable 7518 motor for $299 and save just over $300. $1600 will buy a pretty nice shaper AND some cutters. I’m really having a real hard time tying to figure out what the target audience for this product is. Maybe someone can enlighten me. There are dozens of larger heavier more stable commercial router tables out there for less than half the price. Looks like a tough sell to me…. Festool seems to target the high-end construction – jobsite market – if there is such a thing; though, I’m not privy to what they were thinking here (or anywhere, for that matter) – one of their underlying mantras is portability. I’m sure it will go over huge with their Faithful. I own several Festool products – the Domino is superb, and their track system is highly functional. I was hoping for more in their RT: I’m interested in a sliding table, engineered-in safety, rock-solid construction, and anything which allows us woodworkers to concentrate on the work, rather than the equipment. IMO the CMS has too small a table, continues their ‘stationary’ approach of spindly legs, and doesn’t deliver enough for the purchase price. It is a very portable system and it can be used with the legs folded on a bench as well. So the job site market would love it, but there are many table top models that are far less expensive that are just as portable. Most likely for those who are already high on the festool koolaid. Disclaimer: I do want a domino. Badly. Interesting comments. The Wood Whisperer gave it pretty high marks. I have not seen it in person as yet but am looking forward to seeing it in person. If you haven’t used the CMS router table you would be in for a pleasant surprise. It is high quality and has a lot of positive features. Although, the forensic analysis in the review (which must have required a lot of time and effort) does identifies a lot of good issues. Likely, it is only worth the money if you want it. Thanks for the write up Chris. Even after watching the Wood Whisperer’s review of the CMS, I could not understand why I would ever want to buy one, and this review confirms my opinion. I am sold on some of their products, like the TS55, but this is not one of them. I think a sliding router table is a terrific idea, but at $1600 it should come with something better than folding chair legs. This is no big deal, you can make a sturdier base, my problem is being locked into the Festool system. There is no way I am going to pony up for one of their routers, my Bosch and DeWalt do just fine at a fraction of the price. If I could use just any router I would consider it, since it seems a great tool for on site work. 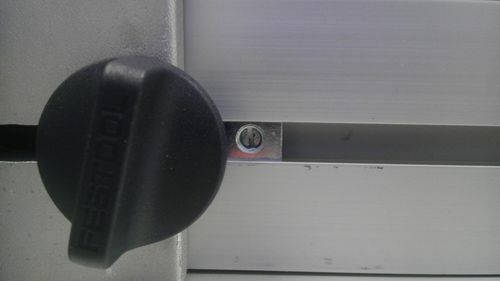 I have not used it or have seen it in stores set up on the floor, but when I look at the bar for the hold down and featherboard system sticking out from the fence, I just think that they would be in the way. Also, when you have to use the festool brand of routers with this table, I don’t see one in my shop any time soon. You can buy a better router table for less money; heck you can build one better than this for a lot less money. Yes, but it will be difficult to drag around your job site. It’s the same as saying that for the cost of high end backpacking tent you could get much sturdier plywood shed from Home Depot. Festool does not compete with dedicated shop based stand alone tools. You must keep in mind that CMS module is designed for professionals who do interior work on site or woodworkers with limited space (hence the size and “wobbliness”). You can get this module from your van and set up in minutes. Does your time cost anything? Pop that router in and out for freehand use with the same router, convert it to table saw or stick jigsaw or belt sander in, all in no time. Can you convert your shaper into table saw (a good one, mind you) while on site? Any savings there? Top it with furniture grade cuts. And at the end of the day you leave your customer’s home spotless. How much does that cost? Having said that the feather board is awkward and the fence micro adjustment (or lack of thereof for the entire fence) and bit changes leave a lot to be desired. I do work on site and would not get one. Here is a pic of my router table, which I do bring on site. What the pic does not show is the added Woodpecker lift. Now mind, this table is rock steady, it comes apart and together probably a bit slower than the CMS but it is way better built. Does it convert into a TS, no but then if I am stuck with the Festool system I can get a nice Bosch contractor’s saw for a lot less. 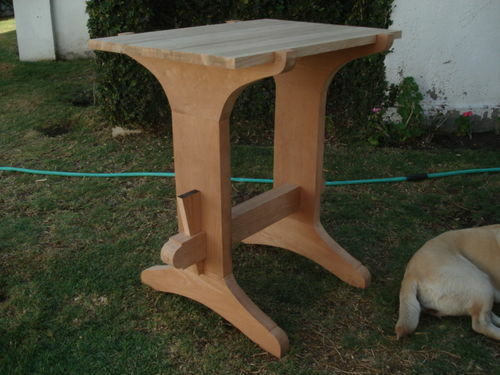 I am guessing this table is to be used with the plunge saw, so lets see, $1600 for the CMS, $500 for the router and and $550 for the “cheap” plunge saw, that is $2600. Way too much, specially for something with flimsy legs like the CMS. Indeed. 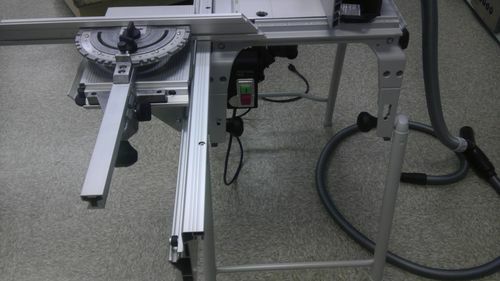 But I find it curious that Grizzly or Jet can sell a heavy-duty, cast iron shaper for $600 less than Festool can sell folding router table….... Albeit, its a pretty nice folding router table. - Just because it is heavy does not mean it is hard to make. Cast iron is cheap, skilled labor and good engineering are expensive. Grizz and Jet can charge that because it’s Taiwanese making it. I assume this is made in Germany like they’re other stuff? Paying to have German build it cost a lot more.